The responses to "The Response" (Gov. Perry's rally at Reliant Stadium spearheaded by hate group the American Family Association) are already underway. The LGBT Texans Against Hate Rally in downtown Houston tonight was a rousing success and all over Houston people are buzzing about how they plan to welcome Perry and his extremist allies tomorrow. One of the responses to "The Response" is the LGBT Trailblazers Luncheon hosted by the Democratic Party of Harris County. The Luncheon tomorrow morning will recognize Mayor Annise Parker, Houston City Council Member Sue Lovell, Judge Steven Kirkland, Judge John Paul Barnich, Judge Phyllis Frye, and Linda Morales for their contributions to the LGBT community and the world at large. Frye, you may remember, became Texas' first out transgender judge (and only the third in the country) last November when she was appointed to the municipal bench by Mayor Parker, but her role as a prominent activist and community leader stretches back to the 1970s. Back then Houston had a "mask law" that allowed the police to arrest anyone whose attire didn't match the gender they were assigned at birth. The law was so strict that women were forbidden to wear pants that zipped up the front (which the police used to raid lesbian bars and round up patrons wearing blue jeans). Because of the mask law Frye risked arrest every time she left the house dressed as a woman. 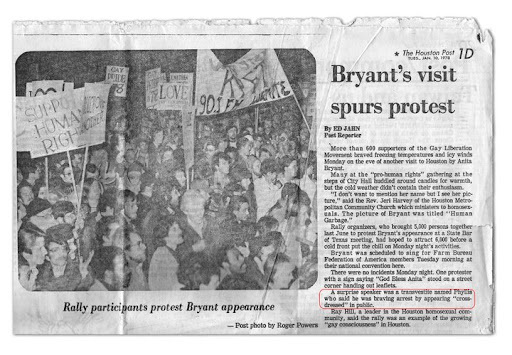 Provided courtesy of the Houston Transgender Archive, the article covers a rally held in response to Anita Bryant's appearance at the Farm Bureau Federation of America meeting in Houston. Bryant was a former beauty queen and singer who in 1977 formed the "Save Our Children" campaign in a successful effort to overturn a Boward County Florida ordinance prohibiting discrimination on the basis of sexual orientation. The article reads "A surprise speaker was a transvestite [sic] named Phyllis who said he [sic] was braving arrest by appearing "cross-dressed" in public." In 1981 Frye's efforts to repeal Houston's mask law paid off and the ordinance was taken off the books. Thirty years later the woman who risked arrest to speak against Anita Bryant's visit to Houston will be honored by the Democratic Party of Houston as a LGBT Trailblazer in an event specifically designed to rebuff another out-of-town visitor who has come to Houston to advocate for the oppression of the LGBT community: Rick Perry. Tickets to the Trailblazers dinner are still available. More information is available HERE.